Ryan and Jon are both architects exploring the potential of systems such as Second Life for collaborative design. In their own words, Wikitecture’s central aim is to explore that question by applying an open-source paradigm to the design and production of architecture and urban planning. In much the same way Wikipedia enables a loose, self-organizing network of contributors to collaborate on content creation, they have been experimenting with ways to bring together a diverse and geographically disperse community of individuals to create an architecturally noteworthy design that, in the end, is more than the sum of its parts. One of the single problems of collaborative design in virtual environments is often the interface itself. 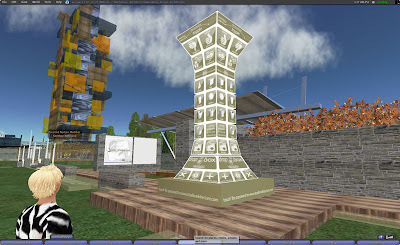 The key to mass participation is an easy to use menu system allowing designs to be submitted, edited and viewed. Studio Wikitecture assumes the principles of good design are universal enough that they can be learned in one discipline and applied in some fashion to another. Through Studio Wikitecture, Brouchoud and Schultz are trying to provide a channel where these individuals can apply their skills to the design of a building. This does not negate the fact that a certain foundational knowledge is still necessary to design a building that will actually function and stand up, but SW feels that this knowledge can be acquired through a number of channels and should not be restricted to just architects and their particular educational path. Take a look at The Arch and StudioWikitecture.com for full details and information on how to take part.